Creates a web tree from a hierarchical document structure. 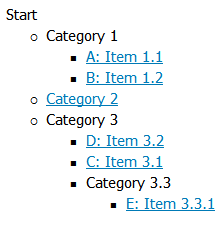 When placed on a Web page this component will render an expanded tree based on a document hierarchy as the sample below shows. This component is typically used when there is a need to show an expanded Web tree representation of the Web site. Often the source of this tree is based on the main menu of the Web site. The document that acts as the root of the document hierarcy that forms the tree. No cache Do not cache the the webmap, the webmap will be rendered from the specified source each time it reloads. Use session cache Cache webmap using session variables. Recommended for an intranet. Use application cache Cache the webmap using application variables. Should not be used in an intranet with security permissions set for the hiearchy items. Cache key name. This name MUST be unique within the site since it is used to store application or session cache data. Do not cache the the webmap, the webmap will be rendered from the specified source each time it reloads. Cache webmap using session variables. Recommended for an intranet. Cache the webmap using application variables. Should not be used in an intranet with security permissions set for the hiearchy items. All menu driven components uses the Content Studio menu API:s and hierarchy document structures. The caller must have BROWSE permission to all items displayed and every item must be live and published. When the menu renders Content Studio traverses through the entire document tree and whenever there is a document that is not available to the caller the traverse operation breaks at this point. This have the effect that any object that is a child of a unavailable document will be left out since the tree is broken at that point.